This model includes an LED lighted lens cover. 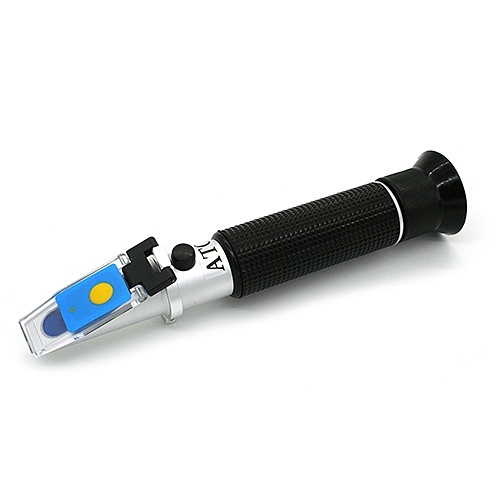 So you no longer need to take your refractometer to a bright room or outside to see the scale. Just push down on the LED tab and lights up your scale to easy take a reading, even in a completely dark room. Used for Reef Tank Aquariums, Marine Habitats, Aquaculture and Environmental Experts! * Included are: A Gray plastic hard case, a pipette for dropping test fluids onto the prism (never dip the refractometer into the test fluid! ), a mini screwdriver for scale calibration, cotton wiping cloth and a Users Guide. 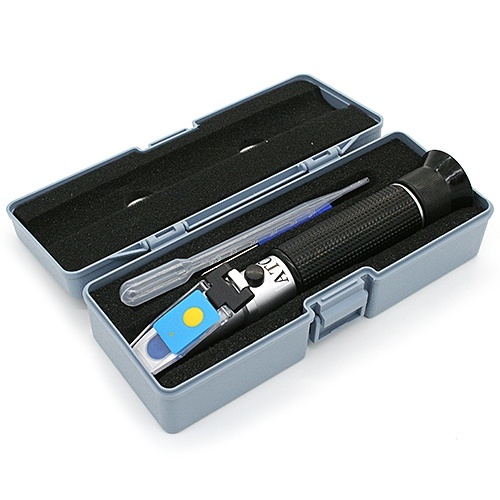 NEW Premium Aquatics RHS-10ATC dual scale portable Salinity Refractometer in a Gray hard case. The RHS series of portable refractometers is designed to measure the salinity of sea water and saline solutions of similar concentration. One scale checks the Salinity levels with the range of 0-100 ppt (with 1 ppt scale divisions) and the other scale gauges Specific Gravity with a range of 1.000 to 1.070 (+/- 0.001 accuracy). Both enable the direct determination of salinity in water that contains dissolved salt and little or no other dissolved solids. Hydrometers are nice, but they can be inaccurate, especially over time. The RHS-10ATC is designed to be very accurate to protect your investments! The unit comes with the "ATC" suffix which is equipped with "Automatic Temperature Compensation" for accurate measurements without recalibration after shifts in ambient working temperature (field use). The ambient temp range for ATC is 50-86'F (10-30'C). If the temp is outside the range (warmer for example), the readings will become gradually inaccurate the further the temp is away from the 50-86'F range. Alternative Calibration using optional Salinity Fluid! How to calibrate with Salinity Fluid: Take a couple drops and read your unit. You should read 1.0259 salinity or 35ppt. Adjust your unit to match one of these two numbers. 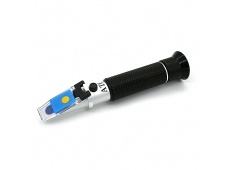 Once you adjusted the refractometer is now fine tuned for saltwater salinity/ppt. If you read ro/di after calibration you will have a negative reading and that is completely normal, as the unit is fine tuned now for a saltwater tank.